Need a quick reference guide for your next lighting specification project? Understanding Classes, Divisions, Groups, Zones, IP Rating, Beam Spreads is simple with our easy to read NEC code single page reference guide. This guide also features a classification comparison chart, enclosure types, and temperature markings. 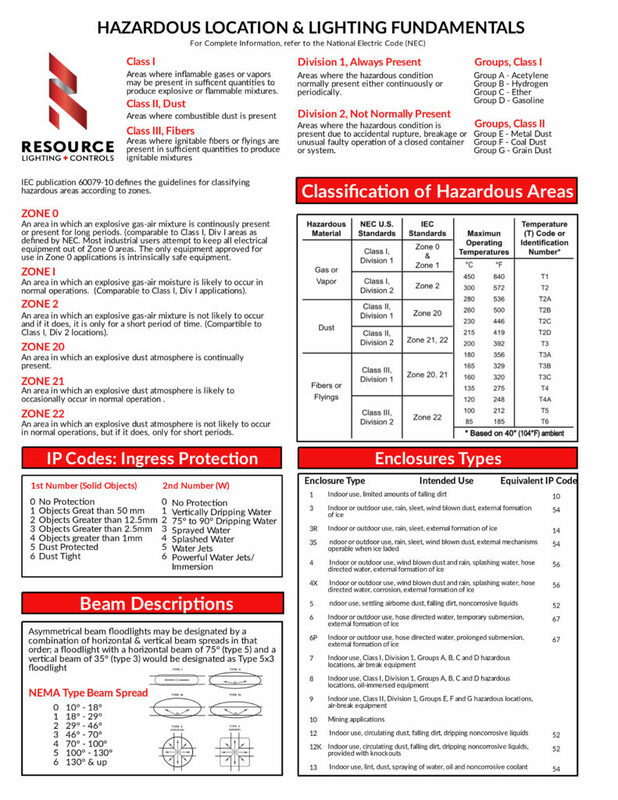 Download the single page Hazardous Location Lighting Resource Guide. Hazardous Lighting is categorized into classes, division, and groups and can be further categorized by zones. For example, Class I consists of areas where inflammable gases or vapors may be present in sufficient quantities to produce explosive or flammable mixtures. Hazardous Lighting Fundamentals Reference Guide Division II consists of areas where the hazardous condition is present due to accidental rupture, breakage or unusual faulty operation of a closed container or system. This combination is often found in a Zone 2 location; an area where an explosive gas-air mixture is not likely to occur, but if it does, it is only for a short period of time. The commonly needed Class I, Div II classification has a number of fixture solutions depending on the application such as the Explosion-Proof LED linear fixture by Rig-A-Lite, the Fidelux FHAZ series, a multipurpose hazardous location fixture used in breweries and processing or the Phoenix Metallic LED VP Series used in walkways, doorways, stairwells and elevator pits. There are three classes and two divisions and zones define the combination of these fixtures. Of course, there are many other considerations such as beam angles, and operating temperatures. The guide is designed to make quick work in determining the correct combination. Resource Lighting + Controls offers a numbers of manufacturers specializing in industrial, marine, harsh environment, food processing, roadway, and oil field lighting. Big-name manufacturers such as Rig-a-Lite, Phoenix, Sonaray, Acuity Brands Industrial meet the needs of specifiers by continually pushing the envelope of efficacy and rugged housing. Visit the Rig-a-Lite hazardous lighting website and it's simple to see how well they understand the needs of specifiers. Filter by Class, Division and Lighting Type. Then easily download the IES files and data sheets. But, the needs of owners are paramount. To complement durable design and performance, Rig-a-Lite provides the unique benefit of field-replaceable circuit boards and drivers. Individual components can be easily replaced as needed with fixtures designed to be highly serviceable.